At Bellamy’s we continually review our products to ensure that they reflect industry best practice and expert nutritional advice. As a result, we are pleased to announce that we have launched a new formula and toddler milk drink range, inclusive of our Step 1 Organic Infant Formula, Step 2 Follow-on Formula and Step 3 Organic Toddler Milk Drink. As with all of the products in our range, our new formulations have been created to the highest safety, quality and nutritional standards, and now combines certified organic with scientific research. This has ensured that the new formulations offer not only an improved nutritional profile but also an improved taste and creamier consistency, now supported by 2 x organic certification credentials – ACO & NASAA. You may notice that the new formulations will look slightly different to the old formula when dry such as the colour intensity, simply because the new recipes have a higher content of organic whole milk powder. Our Organic Infant Formula and Organic Follow-On Formula offers a new and improved recipe with the addition of DHA, ARA and GOS. Bellamy’s Organic Infant Formula is nutritionally complete and carefully crafted to provide key ingredients which support the growth and development of babies, from birth through to 6 months of age. Bellamy’s Organic Follow-on Formula is nutritionally balanced and carefully crafted with key ingredients that complement the nutritional and developmental needs of growing babies from 6 months through to 12 months of age. Zinc for healthy hair and nails. While most babies and toddlers would be expected to experience a smooth transition between the old and new formulations, it’s important to remember that every child reacts differently when changing formulas. Because of the addition of new ingredients to our formula, your baby or toddler may initially experience some digestive changes. Whilst this is completely normal when transitioning to a new food or formula, we recommend that you transition slowly from one formula to the other at around 75% original formula with the addition of 25% new formula and increase the new formula over the course of 1-2 weeks. For a bottle using 4 scoops of formula, this would equate to 3 scoops of original formula and 1 scoop of the new formula. Always ensure that both formulas have the same scoop to water ratio. If you are worried about any persistent symptoms, please seek professional medical advice. Bellamy´s is committed to using the freshest possible ingredients and as a result, we now use a proportion of premium Australian organic liquid milk, opposed to solely using milk powders in the manufacture of our formulas and toddler milk drink. 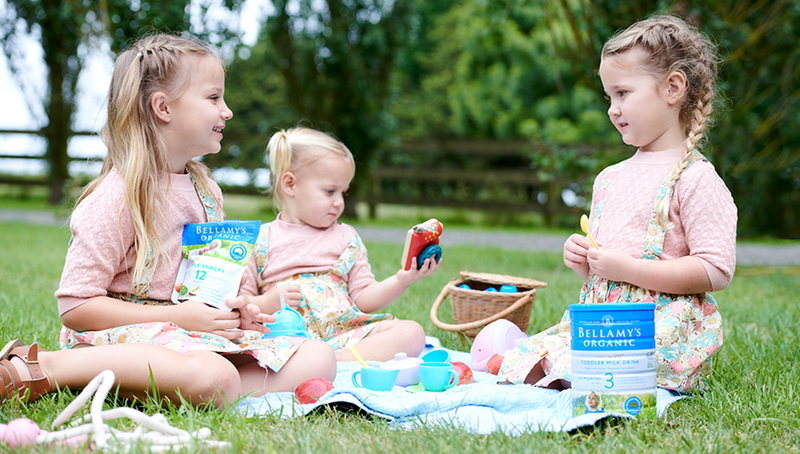 100% of Bellamy´s fresh liquid milk is sourced from certified organic farms in Australia. The use of local sourced fresh ingredients reduces the overall processing of the milk which gives a gentler treatment, protecting the nutritional value of ingredients in our new and improved range. With Bellamy’s, you can be sure that our specially selected certified organic ingredients have been grown without synthetic fertilisers, pesticides and growth hormones. Our formula and toddler milk drink range continue to be certified by NASAA (National Association for Sustainable Agriculture Australia) Certified Organic but in addition, are now also certified by Australian Certified Organic. As an additional security measure, we have introduced a new product coding technology to our reformulated formula and toddler milk drink tins. You will notice that the bottom of each tin now features a blue dot that is laser printed with product coding. This technology enables you to verify the authenticity of the product and batch details and assess further information by scanning of the QR code located in the blue dot.